On Monday 9 May 2016, people across the world, including Europe and North America, will be able to witness the transit of Mercury. 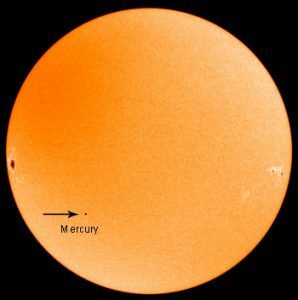 The planet Mercury will be visible as a tiny black dot as Mercury passes between Earth and the sun. Use precautions—view through welder’s glass, as you would for a solar eclipse—if you plan to observe. Transits of Mercury occur roughly every ten years. On the other hand, transits of Venus can be separated from each other by time spans of several years and also time spans of about a century. Mercury and Venus have transits. They are closer to the sun than is the Earth. The outer planets (Jupiter, Saturn, Uranus, Neptune) do not have transits. This entry was posted in In the news and tagged Transit of Mercury. Bookmark the permalink.